I was given the opportunity to go to the The MakeUp Show in LA last weekend. For those of you who don’t know, the show is a two-day event with professional makeup lines, artists, and seminars for people who either work in the field or just love the idea of getting their hands on brand new products-most at a highly discounted rate. 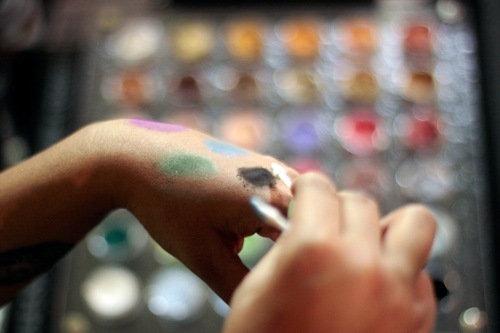 I knew it would be fun –what girl doesn’t love makeup? ?–but I had no idea that it was going to be a makeup wonderland! 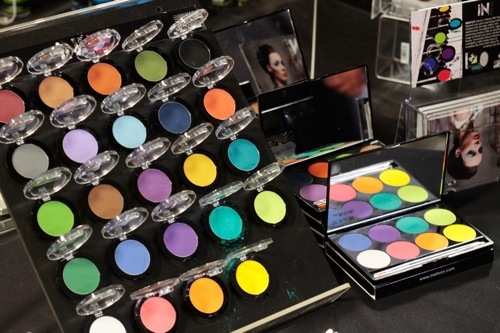 There were 60 exhibitors and over 4,500 attendees including beauty professionals, educators, buyers, and retail shoppers. 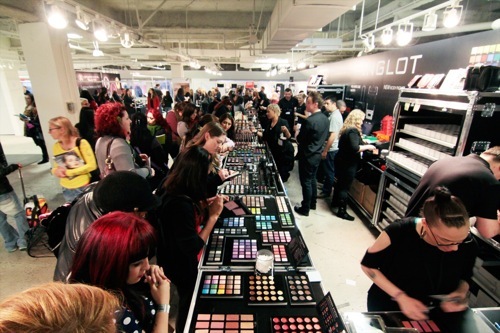 I personally do not wear a lot of make up so as I walked around in awe of the excitement of all the shoppers, I was looking to see what stood out to me the most. I was introduced to Obsessive Compulsive Cosmetics –a 100% Vegan and cruelty free makeup line. I love the idea of lip gloss and lipstick, but I hate the stickiness of the gloss and the crayon feel of lipstick. It was here I discovered their Lip Tars. It was the lightest thing to ever touch my lips and their colors are to die for. It feels almost like Chapstick and when I say it lasts all day….I really mean it. I put just a drop on my lips (another great thing about the Lip Tars so you aren’t running out every two weeks) at 9:30 am and by the time I got home at 4:00 pm, the color had not worn off. I was sold. I walked away with two (Anime and Grandma) and a couple of eye shadows (Authentic and Hum). Their Lip Tars ran at $10 dollars at the show and their eye shadows were $12. And quite frankly, I would have paid more for the results I was seeing. They had an amazing selection of eye shadows with colors that went on so naturally, it gave the perfect amount of shine to make you feel fabulous, but not too over the top, at any occasion. The next line that attracted me was Make Up For Ever. 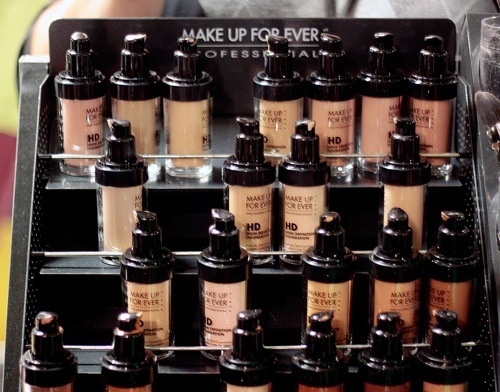 Make Up For Ever is a completely professional line that has been around for over 13 years. They mainly cater to celebrities (Kim Kardashian uses their HD concealer) but they have just opened up a store in West Hollywood where they actually offer classes to help you learn how to wear your makeup right! I thought that was so great because I think the reason I don’t wear a lot of makeup is because I personally don’t know what to put where! Their line of HD concealers really stood out to me because although it is liquid, it leaves you with an airbrushed look. Its purpose is to not be noticed by even the highest quality of HD cameras so it is no wonder so many celebrities swear by it! Not only that, I found it to be very light on my skin and it did not take much of it all to see results. Plus, no touch ups needed. I LOVE THAT. It is a definite investment. Mehron was another line that I stumbled across and had to stop and check out [Editor’s note: I LOVE Mehron! Their foundations are amazing!]. Mehron is a Theatrical and Stage makeup line but I found a lot of stuff that could be worn by the everyday woman. Their newest product is their INtense Pro Pressed Powder Pigments. These are a selection of eye shadows, any color of your choosing, and the best part is, it can also work as a blush AND lip color! That’s right! You can mix and match these babies to make a one-stop shop for your makeup needs. I ended up buying two for myself (Earth Crust and Island Breeze) for 8 dollars each. And just like the other products mentioned, all-day wear. The last thing I was really concerned with was the brushes. I have one brush that I use for everything and it is probably not the smartest idea. Especially because I have a friend in the makeup industry who is constantly telling me that the brush is what is going to give you results. 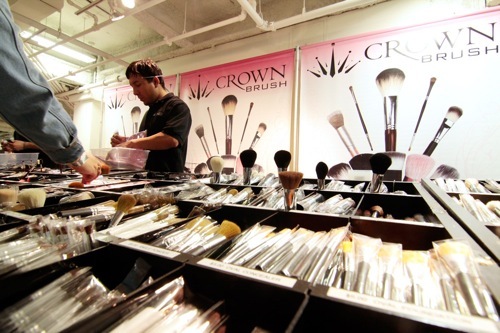 Crown Brush, another 100% animal cruelty-free line that has been around for over 25 years, had every brush imaginable. And they were selling them for 4 bucks a pop! Most of their brushes are made with real hair and although they have some with synthetic ones (the blonde dyed ones), they all felt very natural and gave me a good clean finish with awesome results. I thought it was the best last stop that I could make! Over all the MakeUp Show was a blast! It was amazing to watch people learning how to do eyeliners to runway make up. It is a true art and if you ever get a chance to attend one of these things, I highly suggest you do it! I am really excited to start playing around with all the fun products I went home with! Woo hoo! Wish I could have made it, this looks amazing! Thumbs up for cruelty-free products! 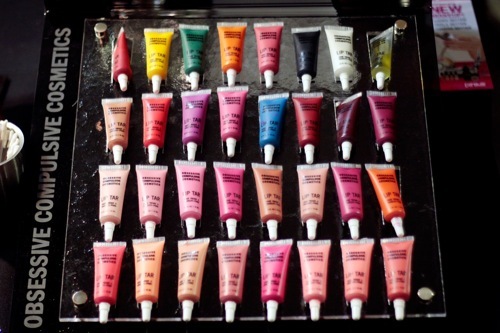 Have to find me some Lip Tar! Are these products for all skin type?